Do you have any patients due for their hygiene visit and/or with treatment that is yet to be started or needs to be completed and their remaining dental insurance maximums are getting ready to expire? Personalize – When mailing out remaining maximum letters, be sure to customize for each patient according to their treatment plan. This will help to re-create the urgency and value for treatment. For some patients, it will take some type of additional incentive to get them to act. Perhaps, include a gift certificate for $ off of their treatment if it’s completed and paid for by December 31st. Not redeemable for cash. 2016 is just around the corner! We want to remind you to take advantage of any unused dental insurance benefits. Make sure to use all available benefits to complete any outstanding treatment or for your all important preventive dental hygiene appointment. Almost all plans do not let you rollover unused dollars to the next benefit year. So, Use ‘Em or Lose ‘Em! We’re ready to help you smile healthier & happier in 2016! P.S. Now is a great time to whiten & brighten your smile for your end of year celebration photos. We have some fantastic whitening specials! Teeth whitening also makes a wonderful gift. P.P.S. Did you know we are on Facebook & twitter? “Like” us on Facebook at … and “follow” us on twitter at …- This way you can stay up to date with all our office events & news plus have a chance at exclusive offers & contests. Mailing Tip – Use a bright-colored envelope and neatly hand-write the name and address. Use a “live” stamp. Important Reminder – Before sending out these letters and making calls to your patients be sure to review your upcoming appointment schedule… Where is your open chair time? Will pre-blocking some open time be helpful? Also, before scheduling last minute appointments that require lab work, be sure to communicate with your lab guy/gal that they can in fact, get these cases back to you in time. Please comment below to share your ideas or to give this post a like. Thank you! If you haven’t yet subscribed to receive free dental marketing ideas via your email each month, please do so today. Feel free to share these posts with all of your dental friends! 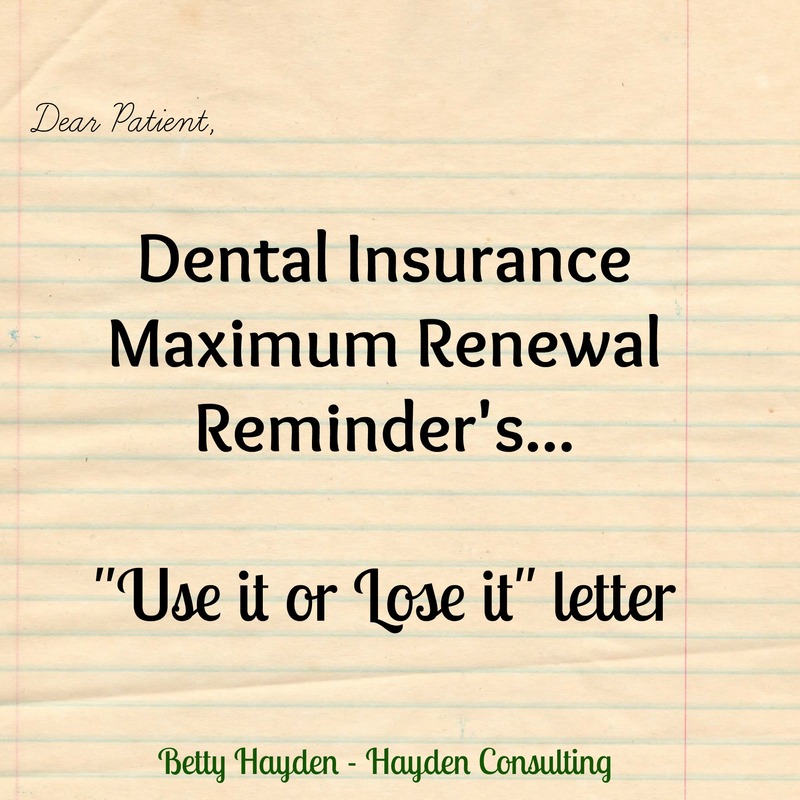 Do you have any patients with treatment that is yet to be started and their remaining dental insurance maximums are getting ready to expire? Time to remind them to Use it or Lose it! – Get your letters out to your patients reminding them to use any insurance benefits they have remaining for the year to complete any needed treatment or for their continuing care hygiene appointment before they lose them. Personalization -When mailing out remaining maximum letters, be sure to customize for each patient according to their treatment plan. This will help to re-create the urgency and value for treatment. For some patients it will take some type of additional incentive to get them to act. 2015 is just around the corner! We want to remind you to take advantage of any unused dental insurance benefits. Make sure to use all available benefits to complete any outstanding treatment or for your all important preventive dental hygiene appointment. Almost all plans do not let you rollover unused dollars to the next benefit year. So, Use ‘Em or Lose ‘Em! We’re ready to help you smile healthier & happier in 2015! Take this opportunity to add a P.S. message to the end of your letter, telling your patients all about your specials on teeth whitening. Many people at this time of year are looking to whiten their teeth for their end of year celebrations, family photos, or to buy gifts for family and friends. Mailing tip – Use a bright colored envelope and hand-write the name and address. Be sure to document that a letter was mailed, phone calls were made and what type of response you received from each patient.